I love this time of the year, you can sure feel Fall in the air today. It is one gorgeous morning in the Midwest. 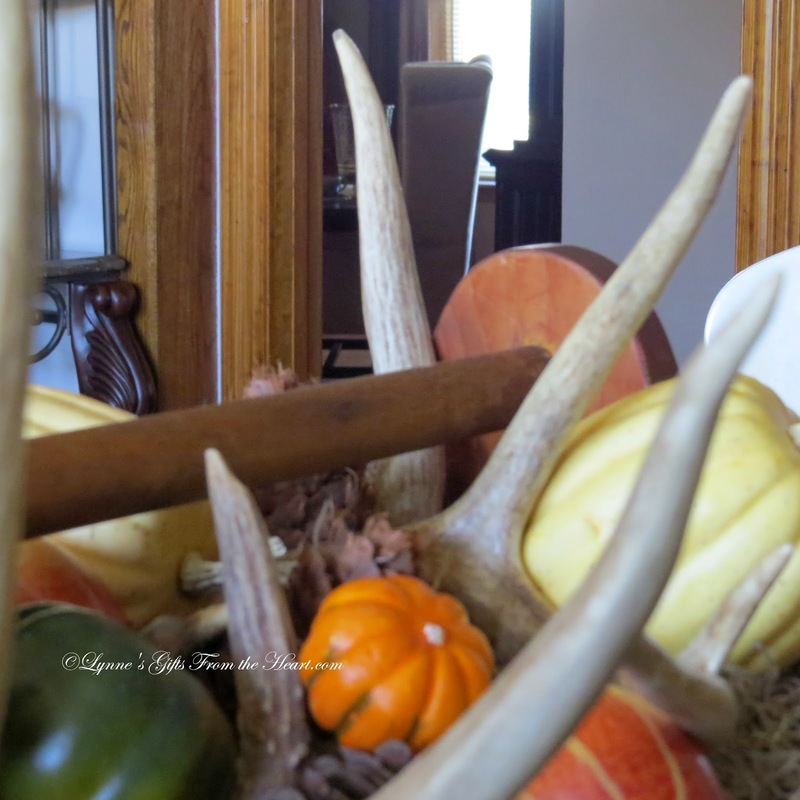 We had a bit of rain last night perfect for staying inside and playing with the Fall decor. for the centerpiece on the kitchen table. This year I chose to use a few items I haven't used in a while, you know what is old is new again. I haven't used the old tool box in a while. The last time was in September of 2011, (guess it was a while) you can view that post HERE. Pulling my elements together was fun. 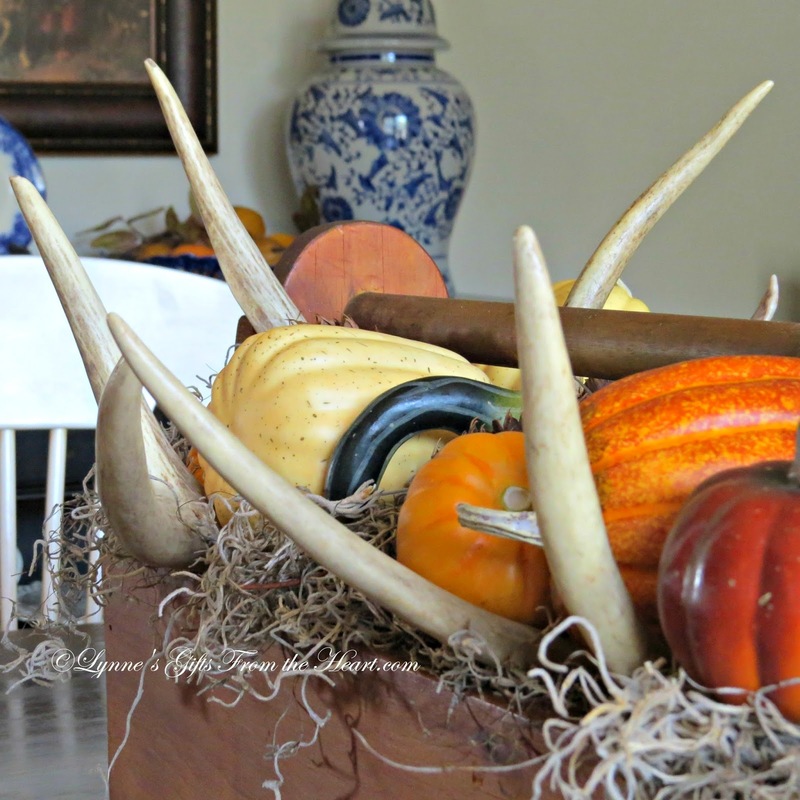 A bit of Spanish moss, a few deer antlers, faux pumpkins and gourds finishing it off with a few pine cones. Voila' the Tool Box Centerpiece. 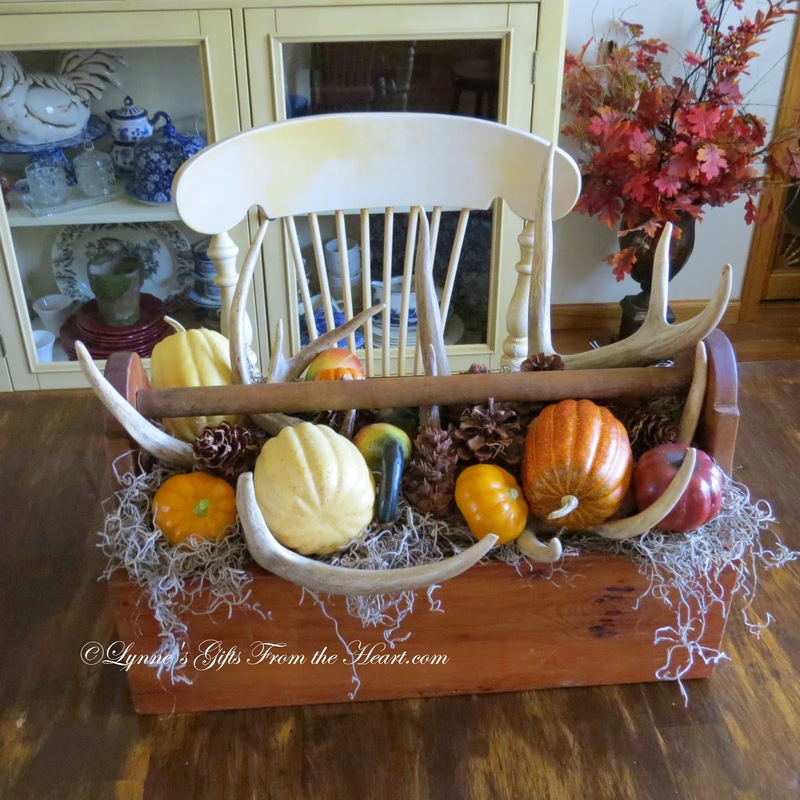 This centerpiece will take you through the Fall season, it's the perfect centerpiece for your Thanksgiving table. Stayed tuned for the tablescape I'm putting together. Have yourselves a beautiful weekend. 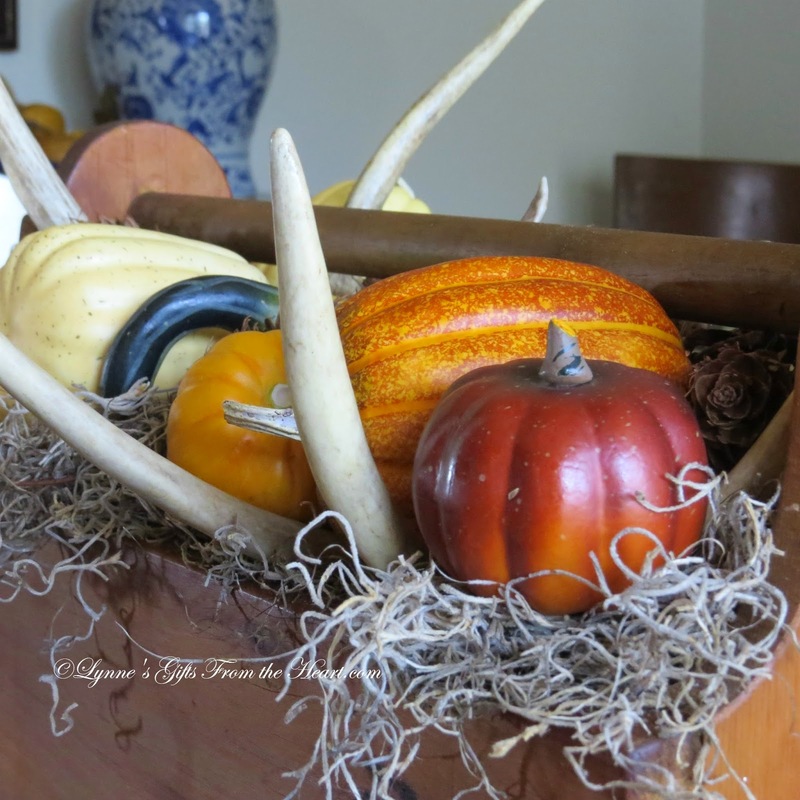 Your center piece looks great and will go with all of your fall decor. Looking forward to your tablescape. Hope you are doing well Lynne - think of you often - hang in there. 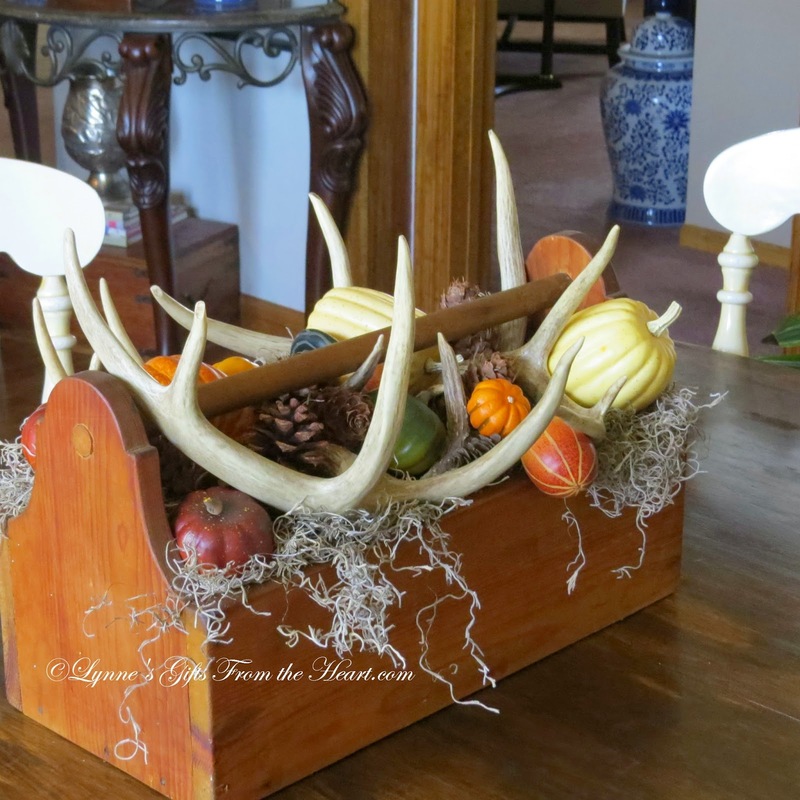 Looks great Lynne- love the use of the tool box and the mix with the antlers. You always have great ideas! Fall is fast approaching isn't it! 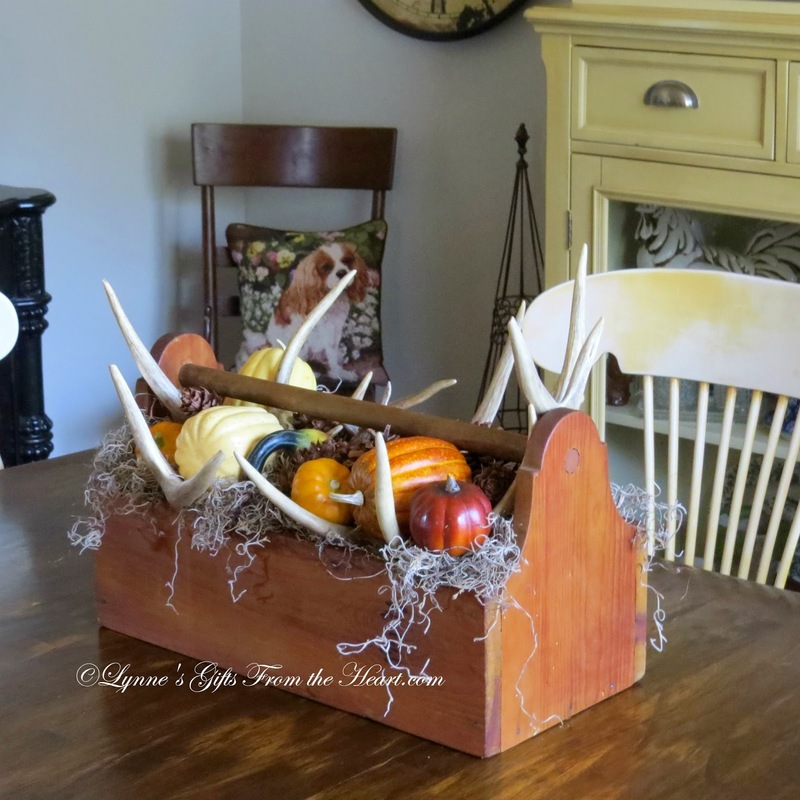 Lynne, your Fall tool box is so pretty! I saw one when I was out thrifting, not long ago. I didn't get it; and now, I regret it. I have seen such wonderful vignettes using tool boxes. 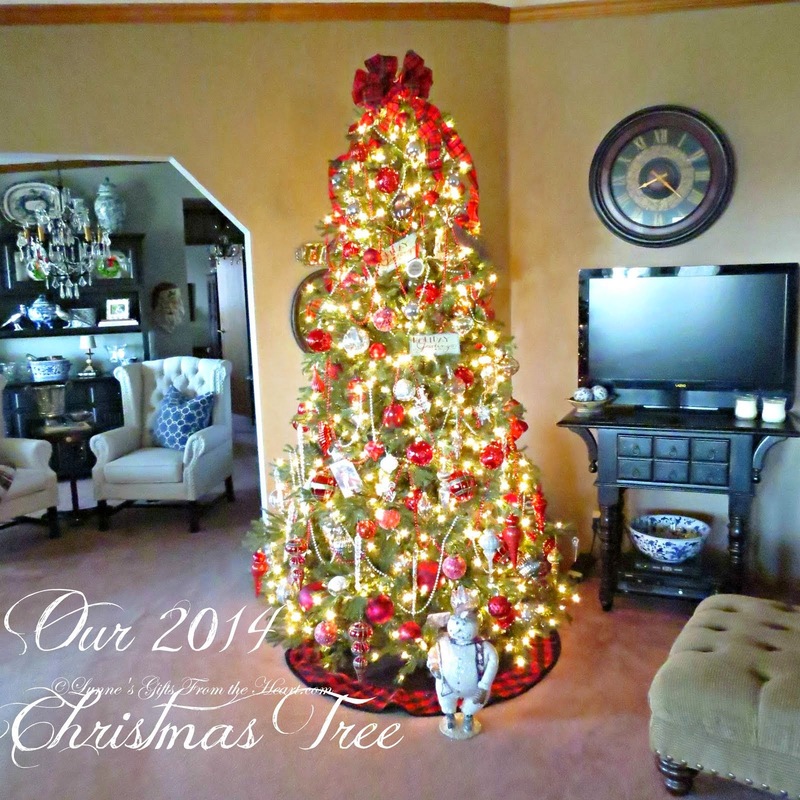 You have decorated yours beautifully! Looks great Lynne. I have started some fall decorating also. 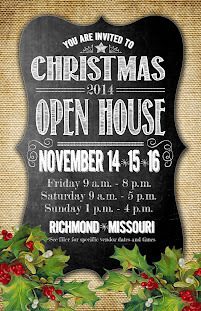 It is my favorite time of year I try to use things that can stay up until after Thanksgiving. Have a good week. I love your tool box Lynn, they have so many possibilities for rearranging them for almost every season. I love Fall and the décor is my fave, C'mas is a different story, but Fall has such gorgeous colors. Great inspiration as I just acquired a tool box, lol! Hi Lynne! 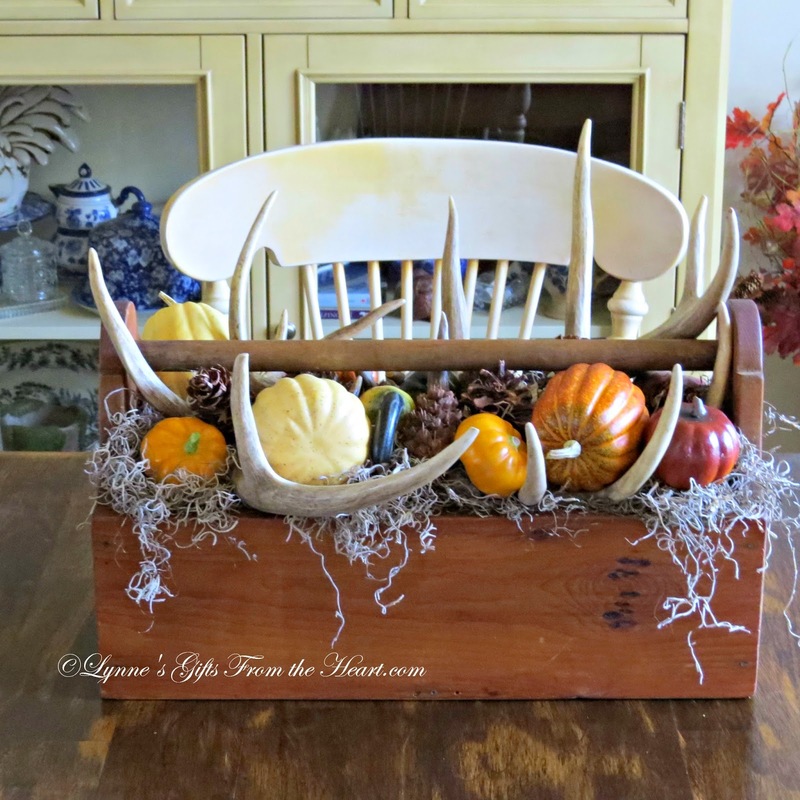 I love your toolbox centerpiece and how you have styled it! 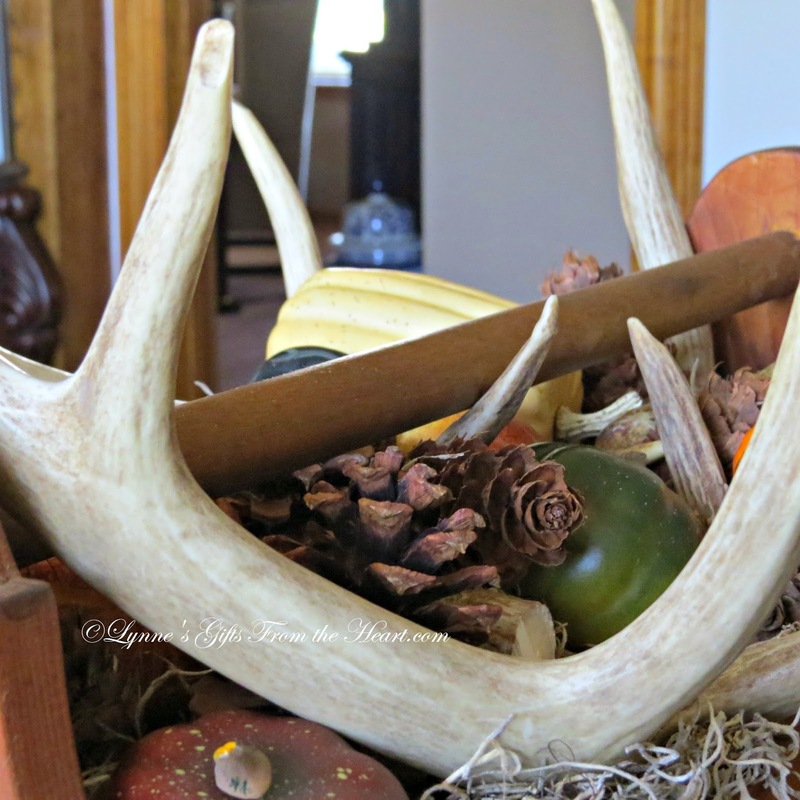 I am using antlers with some Fall decor this year too! Great minds, huh???LOL! Hope you are doing OK. I am in love with FALL!!!! Very Pretty ! No Fall decorating here - Yet. I said I was not going to do any decorating til got some of the chores marked off my list and at the rate I am going, the decorating won't get done. What a unique centerpiece, just love it! Looking forward to moving into fall and changing some decor. Wasn't that little respite nice? I was so happy to see the rain roll through, although I understand some parts of the state really got pounded. I felt bad for those folks. The rain that came through the Kansas City area, though, was gentle and just enough to perk everything up nicely. It's been hot the last couple of days, but the cool, refreshing weather is slated to return tomorrow. Hooray!!! Have a beautiful week, Lynne!